Ready for a Vacation? 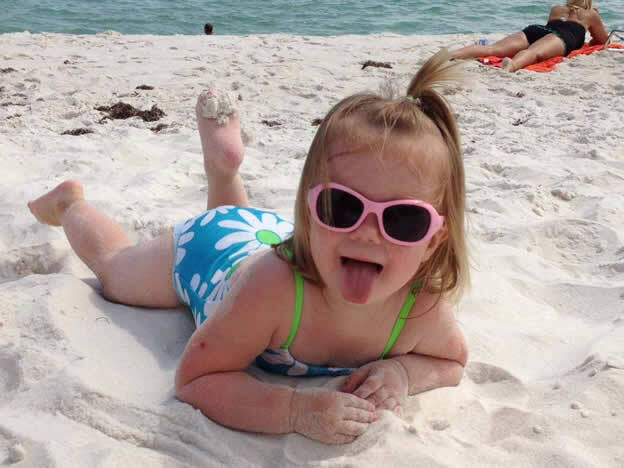 It's Panama Beach Time! 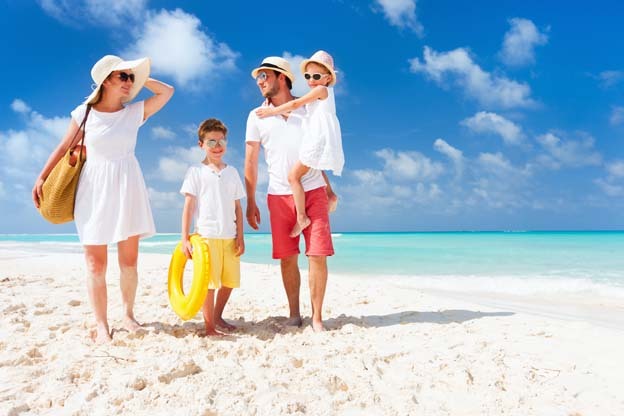 We offer Panama City Beach vacation rentals for every family and every size budget -- Gulf-front, Walk-to-Beach value with a pool, and dog-friendly properties. We have studios, 1, 2, 3, and 4 bedroom condos, townhomes, and houses that sleep up to 12; and most properties have a pool and all have Wi-Fi. To check our rates, click the Rates and Availability button and enter your dates and place cursor over date in calendar. In addition to our Whispering Seas property, we have many other Gulf-front options. Skip ahead to our Gulf-View properties. 5025 Gulf Drive #3 is a beautiful Gulf-front 2BR/3BA townhouse with great views of the beach and the awesome sunsets over the Gulf. This beachfront townhouse will sleep 8 people, with a Queen bed in the Master BR, which has a private, Gulf-front balcony, two Full beds in the Guest BR and a sleeper sofa in the LR. Flat screen TVs in living room and both bedrooms. Fully equipped kitchen and full-sized washer & dryer; Wi-Fi. Private balcony and patio area and a shared larger sundeck right on the beach. Nautical Watch B6 is a beautiful 1BR/1BA coming on a rental program for first time in Fall 2018, so the pristine condition and luxurious details -- along with great views -- extend throughout the condo. This beachfront beauty sleeps 2 with a King bed in the bedroom, which enjoys Gulf views and a flat screen TV. Spacious and open concept living room with large flat screen TV, fully equipped kitchen and dining area. Gulf-front Balcony; Washer/Dryer and Wi-Fi in Condo; Steps to the pool. Condo is on second floor and there's no elevator. Two person maximum occupancy. Adults 30 and over. 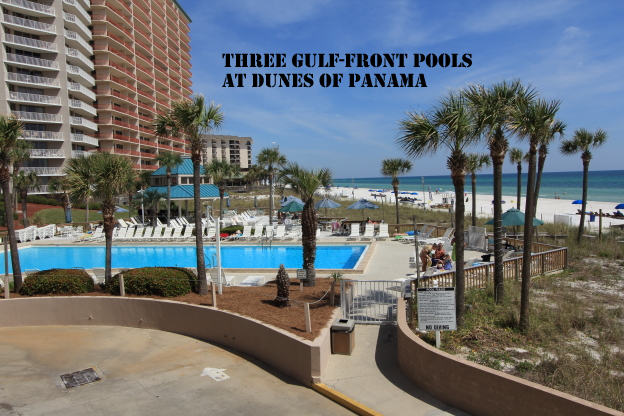 Dunes of Panama D-502 is a 2BR/2BA Gulf-front condo that sleeps 8. King Size bed in Master; Great Views; fully equipped kitchen, balcony on the beach and Wi-Fi. 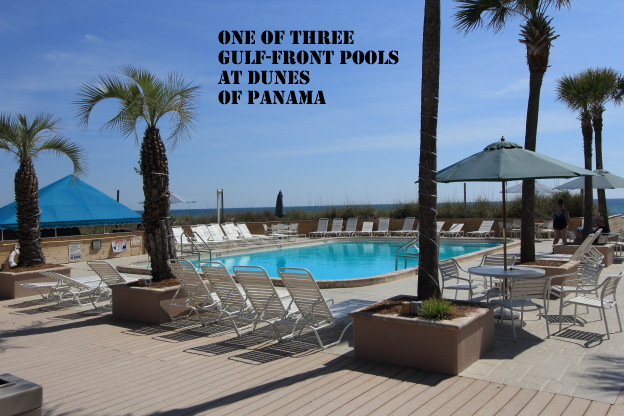 Dunes of Panama offers three pools on the beach, including a seasonally heated pool, Suds Weezers - a poolside Snack Bar and Grill, tennis, basketball court, Kiddie Playground on the beach and more. Sunswept 101 is a beautiful 1BR/1BA Gulf-front, first floor condo that sleeps 4 with a Queen bed in the bedroom and a sleeper sofa in the living room. Fully equipped kitchen. Flat screen TVs in living room and bedroom; Washer/Dryer in Condo; Balcony; Wi-Fi. Sunswept 108 is a beautiful 1BR/1BA Gulf-front, second floor condo that sleeps 4 with a Queen bed in the bedroom and a sleeper sofa in the living room. Fully equipped kitchen Flat screen TVs in living room and bedroom; Washer/Dryer in Condo; Balcony; Wi-Fi. This condo is up one flight of steps and there's no elevator. Sunswept 110 is a Gulf-front 1BR/1BA condo that sleeps 4 with a Queen Bed in the bedroom and sleeper sofa in the living room. The kitchen is fully equipped with washer/dryer in the bedroom. Resort amenities include a large, seasonally heated pool and grills and picnic areas throughout the grounds. Wi-Fi. Summit 214 is a Gulf-front 1BR/1.5BA condo that sleeps 6 with a King bed in the bedroom, twin bunk beds in the hall and a sleeper sofa in the living room. The 2nd floor location is super convenient and it's steps to the stairs or elevator. Fully equipped kitchen. Great balcony views and Wi-Fi. Resort amenities include 2 Pools, including a seasonally heated pool, & 2 Hot Tubs, Tennis Courts, Fitness Center, The Market Shop with food, drinks, ice and snack bar and The Tiki Bar for adult beverages. Coin-operated laundry facility on property. 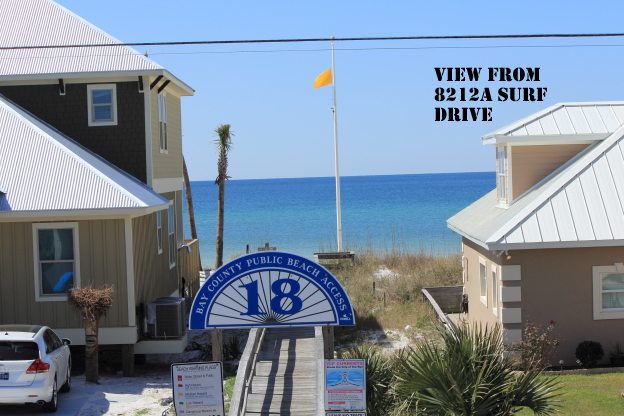 Summit 1222 is a Gulf-front 1BR/1.5BA condo that sleeps 6 with a Queen bed in the bedroom, twin bunk beds in the hall and a sleeper sofa in the living room. Fully equipped kitchen. You will enjoy the beautiful views from the Gulf-front balcony. Resort amenities include 2 Pools, Fitness Center, Market Shop and Tiki Bar. Coin-operated laundry facility on property. WaterCrest 210 is a large and beautifully decorated Gulf-front 2BR/2BA condo that sleeps 8 with a King Bed in the master bedroom plus a Queen and Full beds in the guest bedroom and a sleeper sofa in the living room. Fully equipped kitchen. 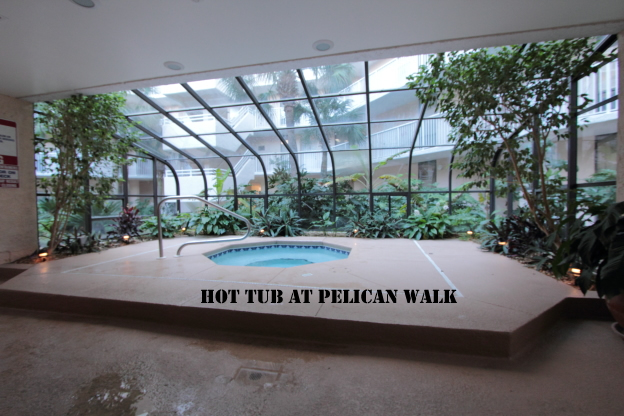 Wi-Fi & Washer & Dryer in Condo; Gulf-front Balcony; Pool & Hot Tub on Beach; Poolside Tiki Bar & Grill and Fitness Room. 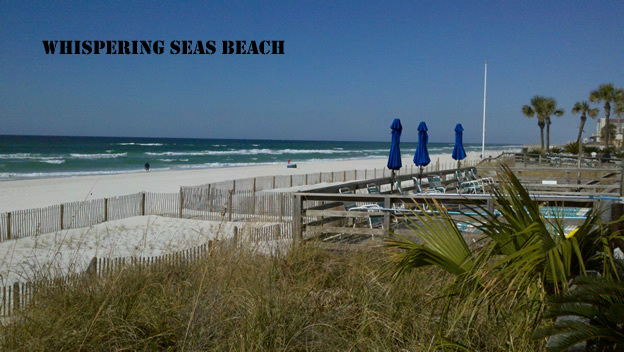 We also have several Gulf-view properties that are just steps to the beach. Sunrise - 6006 Thomas Drive -- Beautiful, new 5BR/3BA Gulf-view duplex townhouse that sleeps 12. 1st floor BR has King bed, 2 BRs on 2nd floor have Queen bed, 3rd BR on 2nd floor has a Full/Twin bunk bed with twin trundle and master BR has a King bed and Gulf-view balcony. Easy walk just across Thomas Drive and one block to the beautiful beach! Fully equipped kitchen; Back patio with grill; Foosball Table; Washer & Dryer; Wi-Fi. Sunset - 6008 Thomas Drive -- Beautiful, new 5BR/3BA Gulf-view duplex townhouse that sleeps 12. 1st floor BR has King bed, 2 BRs on 2nd floor have Queen bed, 3rd BR on 2nd floor has a Full/Twin bunk bed with twin trundle and master BR has a King bed and Gulf-view balcony. Easy walk just across Thomas Drive and one block to the beautiful beach! Fully equipped kitchen; Back patio with grill; Foosball Table; Washer & Dryer; Wi-Fi. 6618 Gulf Drive is a beautiful 3BR/2BA beach bungalow that is just steps to the beach. 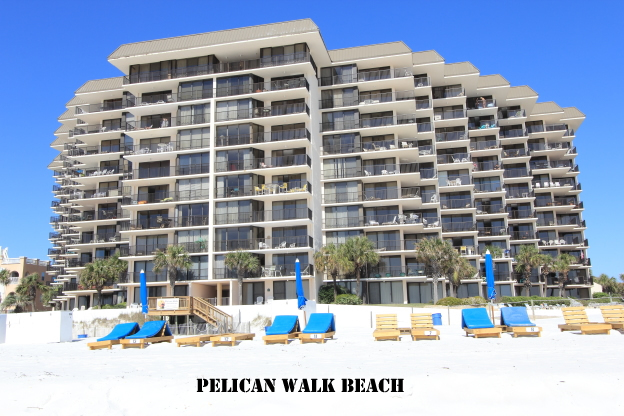 It's just right across tiny Gulf Drive to the beach access and the white sandy beaches and emerald waters. This mid-century gem sleeps 8 without a sleeper sofa -- everyone gets a bed. There's a King bed in master bedroom, Queen beds in the other two bedrooms and two twin day beds on the sunporch. Fully equipped kitchen; Front patio with grill; Washer & Dryer; Wi-Fi; Parking for two vehicles. Windsong Duplex - 6712 Gulf Drive -- a totally updated and dog-friendly 2BR/1BA duplex that sleeps 6 -- front half of Windsong Duplex. Sleeps 6, with a Queen bed in each bedroom and a sleeper sofa in the living room. Fully equipped kitchen & dining area w/Gulf-view. Washer/Dryer; Wi-Fi; Amazing Gulf views from the two-level deck and dining area and living room. Fenced Yard. 8212A Surf Drive has it all!-- a dog-friendly 2BR/2BA Gulf-view town house that sleeps 6, has a fenced back yard for your pup, and is just steps to the white sandy beaches. You will love the beautiful views of the beach and sunsets from the second floor living areas - including the kitchen, dining and living room and large balcony. There's a King bed in master bedroom; and the guest bedroom has a Queen bed plus a sleeper sofa in the living room. Wireless internet. Fully equipped kitchen. Full size washer and dryer. Nautical Watch C8 is a 1BR/1BA condo that sleeps 4 and is right across the parking lot to the resort's beach access. Gulf-view from bedroom window. You'll love the balcony overlooking the pool. Queen Bed in bedroom and sleeper sofa in living room. Fully equipped kitchen. Washer/Dryer. Wireless internet. These beautiful properties combine value and convenience and are just steps to the beach and have a pool. With fully equipped kitchens, washer & dryer in the condo, and dedicated wireless internet, you'll enjoy the conveniences of home and the option to cook in and save more. Ready for an affordable vacation? It's Panama Beach Time! 6804 Beach Drive is a 4BR/3BA townhome with a private pool in the fenced back yard and sleeps 11. Easy walk of just two blocks to the beautiful beach! Fully equipped kitchen; Flat-sceen TVs; Three full baths and two half baths. Balconies on 2nd & 3rd floor with glimpse of Gulf from 3rd floor balcony; Wi-Fi. 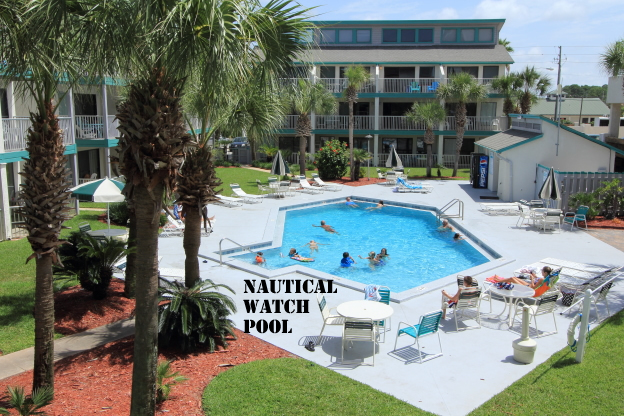 Nautical Watch C8 is a 1BR/1BA condo that sleeps 4 and is right across the parking lot to the resort's beach access. Gulf-view from the bedroom & there's a balcony overlooking the pool. Queen Bed in bedroom and sleeper sofa in living room. Fully equipped kitchen. Washer/Dryer. Wireless internet. Nautical Watch E6 is a 1BR/1BA steps-to-beach condo that sleeps 4 with Queen Bed in bedroom and sleeper sofa in living room. Fully equipped kitchen and Balcony overlooking the pool. Washer/Dryer and Wi-Fi in condo. Sandcastle Villas #3 is a 2BR/1BA loft-style condo that sleeps 6 with a Queen Bed in one bedroom and two sets of Twin bunk beds in the other bedroom. Fully equipped kitchen. Gulf-view deck and laundry closet with full-size washer and dryer. Pool with convenient poolside restrooms. Wi-Fi; 1/2 Block to the beach. Sandcastle Villas #9 is a studio that sleeps 4 with a Queen bed and a sleeper sofa and is just a half-block to the beach! Fully equipped kitchen; and table seating for four in the kitchen and on the patio which has a glimpse of the Gulf. Flat-sceen TV; Full bath; Full-size washer and dryer; Wi-Fi; Pool with convenient pool-side bath house. Sandcastle Villas 11 is a studio that is just a half-block to the beach and sleeps 4 with a Queen Bed and a sleeper sofa. Fully equipped kitchen and full bath. Private porch with glimpse of the Gulf and laundry closet with washer and dryer. Wi-Fi. Pool with convenient poolside restrooms. Sandcastle Villas 12 is a studio that is just 1/2 block to the beach. This corner unit boasts great views and natural light. Queen bed & sleeper sofa; Fully equipped kitchen and Full bath. Private porch with a glimpse of the Gulf and washer/dryer combo in laundry closet. Wi-Fi. Pool with convenient poolside restrooms. Sandcastle Villas 15 is a steps-to-beach studio that sleeps 4 with a Queen bed and a sleeper sofa. Fully equipped kitchen & Full bath. Swivel-mounted flat screen TV so you can see from living area or bed & Wi-Fi. Private porch with glimpse of Gulf and washer/dryer combo in laundry closet. Pool with convenient poolside restrooms. 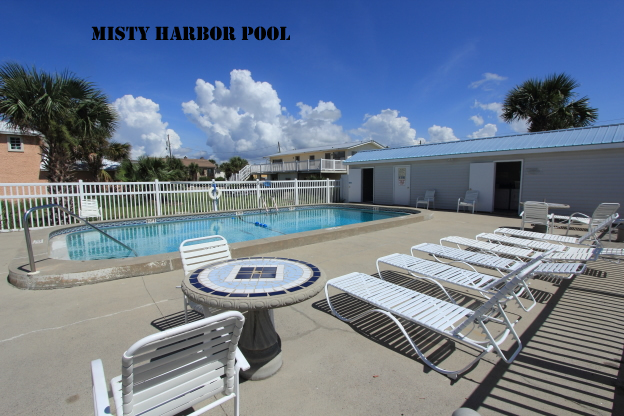 Sunswept 206 is a ground floor 1BR/1BA condo is steps to both the pool & the beach and sleeps 4 w/Queen bed in bedroom & sleeper sofa in living room. Fully equipped kitchen; Washer/Dryer in condo; Wi-Fi. Ground floor patio is steps to large pool. Sunswept 202 is a 1BR/1BA ground-floor condo that is just steps to the beach. The unit sleeps 4 with a King Bed in the bedroom and sleeper sofa in the living room. The kitchen is fully equipped and there's a washer/dryer in the bedroom. Resort amenities include a large, seasonally heated pool and grills and picnic areas throughout the grounds. Wi-Fi. Sunswept 413 is beautiful 1BR/1BA condo on the ground floor that is just steps to the beach. The unit sleeps 4 with a Queen Bed in the bedroom and sleeper sofa in the living room. The kitchen is fully equipped and there's a dedicated wi-fi network in the condo. Pool and Grilling Area just steps from patio. No Washer/Dryer in Condo -- Coin-Op Laundry Room on Grounds. Sunswept 414 is beautiful 1BR/1BA condo on the ground floor that is just steps to the beach. The unit sleeps 4 with a Queen Bed in the bedroom and sleeper sofa in the living room. Fully equipped kitchen and washer/dryer and dedicated wi-fi network in the condo. Ground floor patio that is just steps to the pool and grills. Sunswept 423 is 1BR Plus Loft/1BA recently renovated and beautifully updated, steps-to-beach condo that sleeps 6 with a Queen bed in the bedroom, two twin beds in the loft, and a Queen sleeper sofa in the living room. Renovated and Fully equipped kitchen. Balcony with pool view. Glimpse of Gulf at front door. Wi-Fi; Pool; No Washer/Dryer in Condo - Coin-Op Laundry Room in Resort. NOTE: THIS CONDO DOES NOT HAVE A POOL. Close to 30A, 131B Southfields Road is a ground floor 2BR/2BA condo that is just a 1/2 block to the beach on PCB's west end. The condo sleeps 8 with a Queen bed in the master bedroom, a Full & Twin bunk bed and Twin bed in the second bedroom and two roll-away twin cots for the living room, that would be best for kids. Fully updated and equipped kitchen. Washer/Dryer in condo. Patios in front and back. Wi-Fi. Parking limited to 2 vehicles. Don't leave your dog in a kennel -- bring them on on vacation and you won't have to worry about your pup while you're at the beach. All bookings with a dog are charged a $50 pet fee plus tax. Windsong Duplex - 6712 Gulf Drive -- a totally updated and dog-friendly 2BR/1BA duplex that sleeps 6 -- 2BR/1BA - front half of Windsong Duplex. Sleeps 6, with a Queen bed in each bedroom and a sleeper sofa in the living room. Fully equipped kitchen & dining area w/Gulf-view. Washer/Dryer; Wi-Fi; Amazing Gulf views from the two-level deck. Fenced Yard. Windsong Duplex - 6714 Gulf Drive -- a lovely and dog-friendly 2BR/1BA duplex that sleeps 6 -- is right across the street from the beach and enjoys amazing Gulf views from the two-level deck. Windsong Duplex has a Queen bed in each bedroom and a sleeper sofa in the living room. Enclosed back yard for your pup. Fully equipped kitchen; Wireless internet; Washer and Dryer right in unit; Grill. 8212A Surf Drive is a dog-friendly 2BR/2BA Gulf-view town house that sleeps 6, has a fenced back yard for your pup, and is just steps to the white sandy beaches. You will love the beautiful views of the beach and sunsets from the second floor living areas - including the kitchen, dining and living room and large balcony. There's a King bed in master bedroom; and the guest bedroom has a Queen bed plus a sleeper sofa in the living room. Wireless internet. Fully equipped kitchen. Full size washer and dryer. OUR RATES = OUR RATES! NO HIDDEN FEES OR EXTRA CHARGES! The posted rates include all fees but do not include 12% state and county tax. (We charge a $300 refundable security deposit for Spring Break bookings in March and a $50 additional pet fee for our dog-friendly properties. Bookings at The Summit have a 13% state and county tax and are charged an added resort fee of $16.89 at registration at The Summit for wristbands and parking permits. For Summit Spring Break check-ins, the resort fee is $39.42.) Your confirmation from Panama Beach Time will have your total due with tax. By making this reservation, you agree to these terms and conditions. You will receive a confirmation of your reservation by e-mail. The automated reservation request from our online booking engine is not your final confirmation. 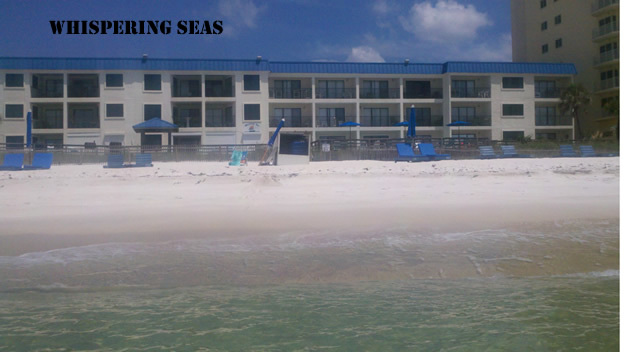 Your reservation is not confirmed until you receive your confirmation from Panama Beach Time. 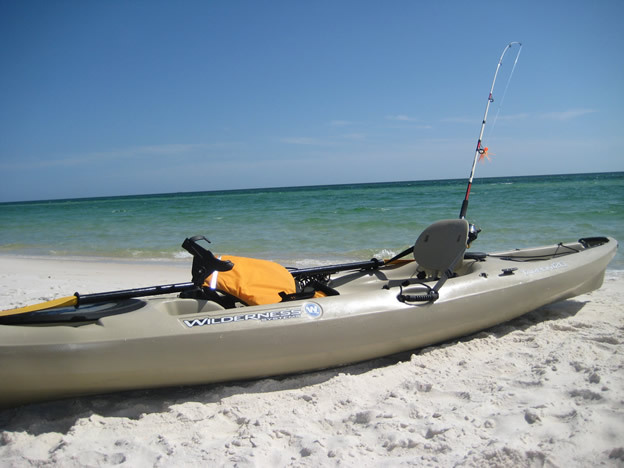 Panama Beach Time assumes no liability or responsibility for personal property or personal injury. Please call us at 850-708-1429 or e-mail us with any questions. The stated number of guests allowed in each property is a strict maximum occupancy limit; no additional guests are allowed. 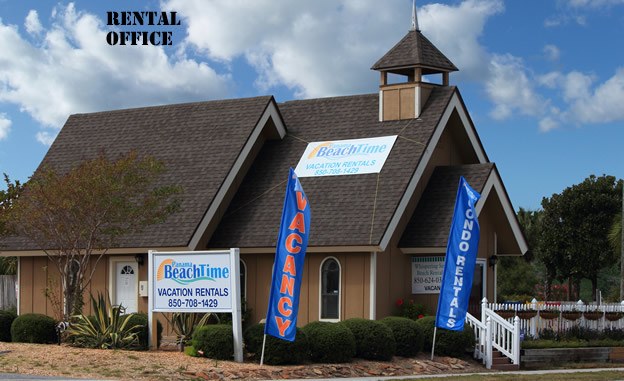 Please come to our Panama Beach Time rental office at 6815 Thomas Drive for check in. You will need to sign a check-in agreement and pay the balance due at check in. Check-in is 3:00 P.M Central Time and check-out is 10:00 A.M Central Time. We need enough time to get your condo ready for your check-in, so it is difficult to accomodate early check-ins. Cleaning staff can not assume responsibility for your luggage. Each unit will be stocked with linens and bath towels when you arrive. We'll also get you started with an initial supply of essentials, like hand soap, paper towels, toilet paper, dishwasher detergent, and trash bags. We do not supply refills of these items or any laundry detergent or charcoal for the grills. Please do not remove bath towels from your unit and please bring your own beach towels. We do not allow smoking inside the properties and most do not allow pets. There will be a $300 charge for smoking or pets in any of the properties that are not pet friendly. Parking is limited. We can only provide a maximum of two parking permits per condo. Vehicles parked without a parking permit will be towed. The onlne reservation system does not properly process or accept reservation more than 10 months in advance. 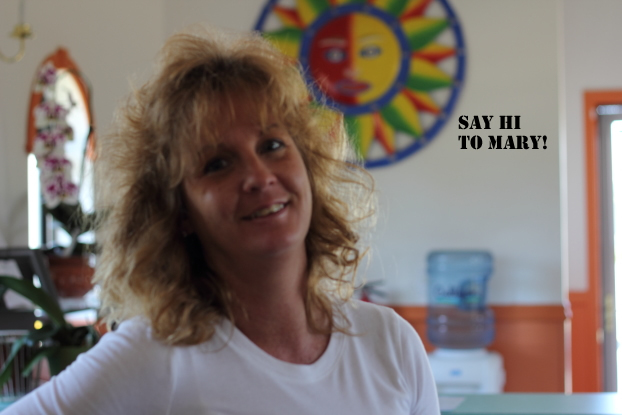 Panama Beach Time does not guarantee rates or availability information more than 10 months in advance. Regardless of any automated e-mail confirmation from our online booking engine, Panama Beach Time does not confirm reservations in any circumstances more than 10 months in advance. For all reservations, we will charge the card on file at the time of the reservation for the cost of one night's stay -- not including tax. This payment at reservation will be deducted from your balance due at check in. The balance due for all Spring Break bookings must be paid in full two weeks in advance. We can not confirm any bookings until we have received this one night payment. Due to credit card fees, there is a $25 processing fee for all refunds related to cancellations. If you cancel within the cancellation window, we will refund the one night payment to your credit card, less the $25 processing fee. If you cancel with less notice, we will not refund your initial payment as a cancellation fee. The cancellation window is 6 weeks for monthly bookings and Summer bookings with check in dates in June or July. The cancellation window is 4 weeks for mid-March to mid-April, Memorial Day, Labor Day, Thunder Beach and Florida Ironman. The rest of the year, the cancellation window is 2 weeks. If you cancel with enough notice, we refund your one night payment less a $25 processing fee. If you do not cancel with enough notice, we do not refund your one night payment. Payments can not be transferred to future bookings. If you do not show up and do not call to cancel your reservation, you will be charged a $300 no-show fee. Please take the time to call and cancel if you are not coming. Thank you for your courtesy. 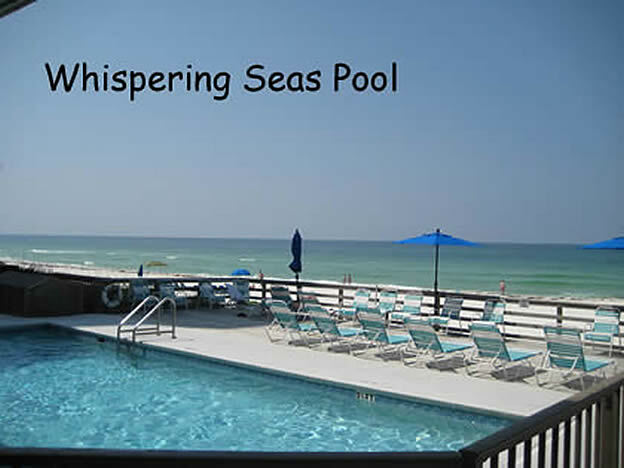 The ground floor two bedroom condos and the three bedroom unit at Whispering Seas are limited to weekly stays from Saturday-to-Saturday only from the third Saturday in May to the second Saturday in August. All of our Gulf-front condos at Whispering Seas, The Summit, Gulf Gate, Regency Towers and Pelican Walk are limited to weekly Saturday-to-Saturday from the last Saturday in June to the last Saturday in July. The age limit to reserve a room is 25. We can not reserve a unit to people who are under 25, except at The Summit, which allows over 21 during Spring Break. For Spring Break bookings at The Summit, in addition to the balance due, we also collect a $300 refundable damage deposit at check-in. We will refund your security deposit three days after you check out, as long as there are no damaged or missing items. We need the additional time to fully inspect the condo and assess any damage or missing items.